One of the most frequent topics I get questions about is price and, in particular, how to avoid discounting. Salespeople want to avoid discounting (or at least most do), yet they say they can’t close a sale without discounting. The issue comes down to not having a focused sales process and the confidence in themselves and their selling skills. How can anyone expect to win if they don’t have a plan they follow? Yet that is exactly what happens for too many salespeople. They simply do not have a plan to understand the customer and their needs. They fail to follow a plan, and as a result, they fold as soon as the customer mentions any hesitation regarding price. Yes, the lack of a sales process may mean the salesperson has low confidence, although the two are not linked as much as some people want to believe. It is totally possible to have high confidence in oneself and yet not have a solid sales process. Salespeople are quick to blame anything and everything but themselves when something doesn’t go right. The last thing they will do is place blame on themselves, yet that is exactly where it should be. Without confidence in yourself and a process you are committed to, there is little chance for success. Not only are you going to struggle with the issue of discounting, but bigger yet, you’re going to struggle with the issue of even getting to the close. If you’re not confident you can get the sale, there is a high degree of probability you will discount or will try to move the discussion to another meeting. Result is either reduced profit right away or a longer sales process or both! You have to develop the confidence to deal with price head on, which ultimately will lead to higher profits and a shorter sales cycle. 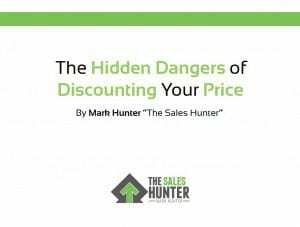 Recently I wrote an ebook on this issue, The Hidden Dangers of Discounting Your Price. I suggest you download it now and use it as a guide to help you get over the hurdle of discounting. PrevPreviousVIDEO SALES TIP: Your View of Profit is All Wrong!